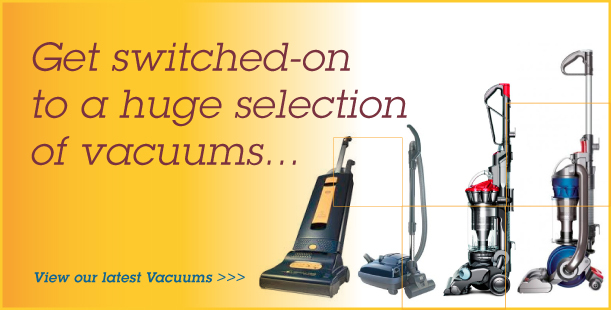 With a choice of upright or cylinder cleaners we have a wide range of vacuums to suit your needs and budget. When choosing a vacuum the most important consideration is the type of floors you have so you select a machine that’s perfectly made for the job. Areas with all carpet will benefit from a machine that has a brush roller to beat the carpet helping pick up hair and dust. Areas with hard floor should choose a cylinder vacuum like a ‘henry’ where a flat head and suction power is needed to glide across the floor. If you have both carpet and hardfloor we’d recommend choosing a vacuum that can be switched between brush roller and flat head. If you’d like more advice on selecting a Vacuum cleaner why not call us or visit our Showroom, we’re always happy to help!